In Weak Economy, College Grads 'Surge' Into Military The weak economy may be bad for most Americans, but it's good for military recruiting. Since the recession began in 2007, there's been a steady increase in the number of college graduates joining the armed forces — including some who never imagined themselves in uniform. Since the recession began in 2007, there's been a steady increase in the number of college graduates joining the armed forces. The Navy and Army have seen the biggest jumps. About 60 percent more college grads joined the Navy last year than in 2007. For some of them, it's a job some would never have imagined for themselves just a few years ago. Louis Lam fits that bill. He's your typical good college student. He's on the dean's list at the University of Maryland, where he studies electrical engineering. He's active in campus organizations. To save money, he lives at home. He even helps his mom make dinner. "Generally I would just get the dishes and stuff ready," Lam says as his mother drips sauce onto meat sizzling in a skillet. OK, maybe he's not helping with the actual cooking. Mom jokes there's a reason for that. "He's not very good," Mydung Lam laughs. But Lam is a great son, she says. 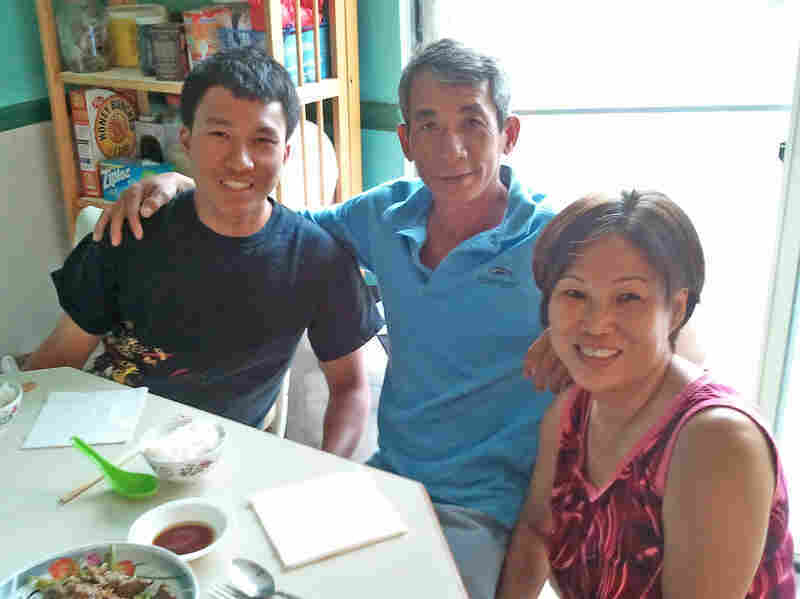 When his parents Tuy (center) and Mydung (right) Lam lost their jobs, electrical engineering major Louis Lam enlisted in the Navy. And that son's plans have changed drastically since he got to college. "What I thought that I'd be doing, going into college as an electrical engineer," Lam says, "I thought that I'd be working with gadgets, making robotic things, [tinkering with] groundbreaking technology." "I was like, I really need to get this job as soon as possible," Lam says. "Otherwise, we might lose the house. We might have to sell some stuff." He saw his college friends struggling to find jobs or internships and says his family couldn't afford for him to go through that. "When the economy worsens, as it has in recent years, we certainly see a surge in the number of young people who are highly qualified, who want to join the military," says Beth Asch, who researches military recruitment for the RAND Corp. It has studied U.S. military recruitment for more than 40 years. Asch says the surge in college graduates looks especially large this time around because of just how far the economy fell. "Since the mid-2000s, the unemployment rate has essentially doubled," she says. And since then, the Army and Navy have seen a more than 50 percent rise in recruits with college degrees, according to their latest numbers. Asch says college graduates make up a relatively small portion of total recruits. But as long as the economy stays weak, their numbers will go up. Part of the reason is that it always pays to have a job with Uncle Sam. "In order to sustain a volunteer force with high-quality people, the military finds it has to pay people more than they would get in the civilian world," Asch says. "That gap has actually increased in recent years, in part because of the continuing rise of military pay and partly because the economy has stagnated, and so civilian pay has stagnated as well." At a naval-recruiting station near the University of Maryland, Lt. Mary Neal says it's almost easy right now for military recruiters. "We have more people coming than we have positions for," she says. "That's just how busy we are. It's sad when we actually have to tell them, 'Sorry, we've already met goal for this year.' "
Neal says almost all the people being turned away have college degrees. She says the perks of a military job are especially appealing right now — good pay, free health care, a tax-free housing allowance and a pay raise every year. Another recruiter at Neal's station pitched all that to Louis Lam before his parents' unemployment benefits ran out. He signed up and is in for five years. Lam says the recruiter also said he could stay close to home. He'll use his engineering background to work on nuclear reactors on submarines and ships, and he can do that from the D.C. area. While he finishes college this year, Lam says, the Navy will pay him about $50,000. "That specifically was very important to me because of our financial situation," he says. "I definitely wanted to say, 'Hey, is this what I'm going to be making? And if it is, then this is exactly what I need right now.' "
Lam says the checks started coming a few months ago, and he's been spending most of them on his parents' mortgage and his student loans. For now, he's giving up the goal he had before he got to college: a career in the private sector with a big-name company. Lam says he's OK with that. There's a much better payout for helping his family and serving his country.